… because I’m going to attempt to kitchener these babies. Here’s hoping I manage to do this without any major issues. For some reason, kitchener stitch eludes me. 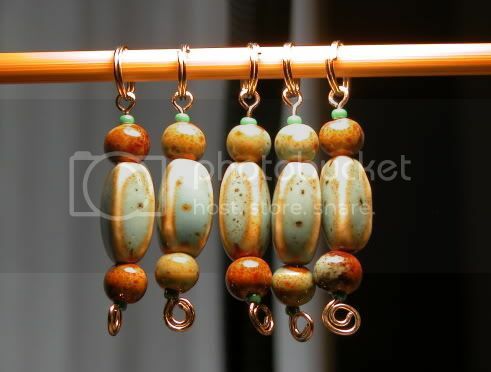 I got a lovely set of stitch markers from sgeddes in today’s mail. Thank you, Shannon! I love them! 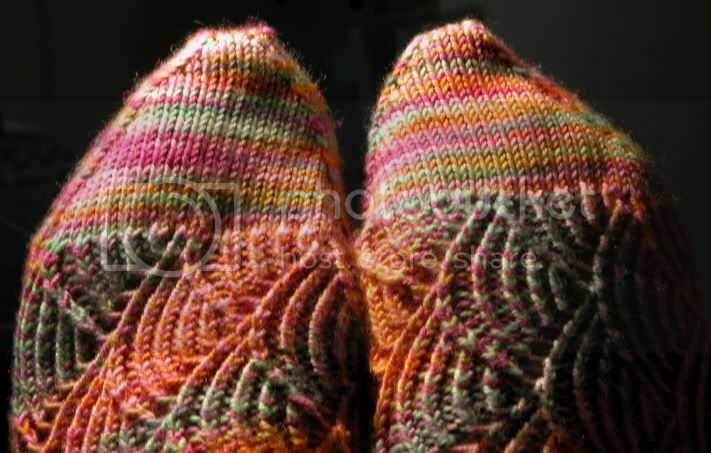 And with that, a finished pair of Pomatomus socks! 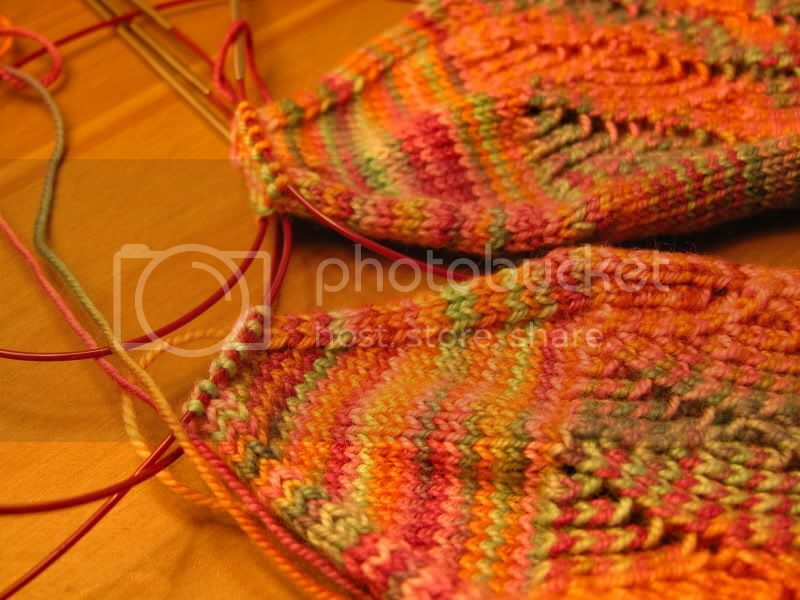 August 4th, 2006 | Tags: FOs, Knitting, Swap | Category: Misc. I think I do kirchener right, but it just never *feels* right to me. I’ve converted to a three needle bind off. Great fall-y colors you have on those socks! Nice work there! Yay! !You did the K-stitch and it looks good! well done on the big K stitch- I must admit it stumped me for a while and i avoided it like seaming but it does look good!!! Fingers duly crossed. They look great especially in that yarn. The stitch markers are so pretty. Great looking Pomas!! Yay for kitchener! Your socks look great! GO Kitchner! 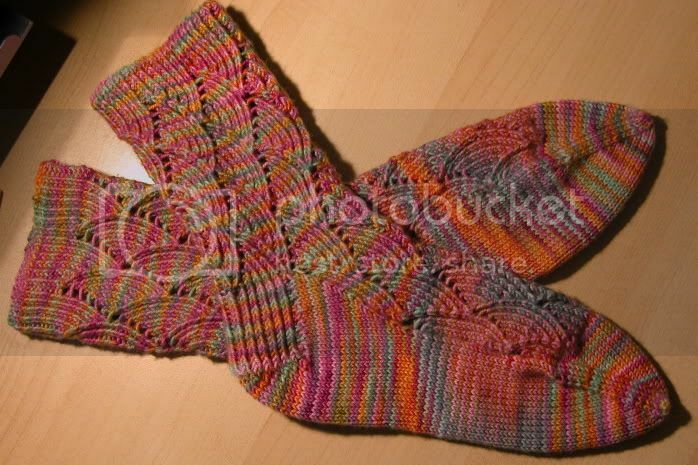 I do like that pattern too, but first, I’m doing the cigar gloves for my DSO. (his hands get cold when he has to change out the frozen foods tags at the store.) looking good. Great job, both the socks in general and especially the kitchener stitch. I’ve been following your blog for a while but never commented before. Couldn’t find your e-mail anywhere, I’d like to ask you something (and don’t worry, I’m neither a spammer nor a stalker). Those socks are gorgeous… The colours! This is the pattern I’m going to attempt next, thanks for giving me hope!